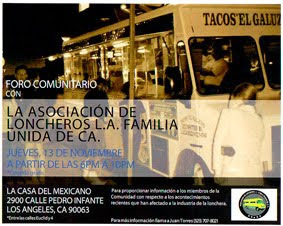 I got off the 10 at Cesar Chavez Blvd and there she was, a little taco wagon parked in the lot of a Lucy’s Laundromat. The crowd of people huddled around suggested something worth investigating. 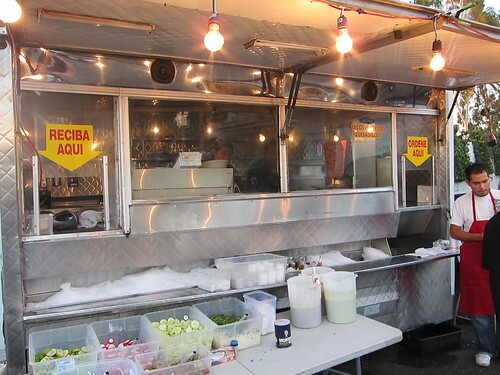 One of the golden rules when taco trucking is go where the crowds are. If anything else the tacos are always fresher. The taco wagon had no name so who am I to give it one? I was tempted to just title this post “Lucy’s Taco’s” because of where the wagon is parked but if the taco wagon does not want a name then it should not have one. You place your order with one of the guys outside the wagon and he hands the ticket to one of the cooks. A table of condiments includes cucumbers, jalapeno and onions, cilantro and onions, and three salsas ; a spicy salsa verde, salsa roja, and avocado salsa. There's no list of meat options or menu. I ordered asada and al pastor and when my order was ready it was packaged to go. In fairness to the guy taking the order I don’t think I said one way or another if I wanted it for here or to go. One rule of taco trucking is to never get your tacos to go. They have a very short street life. 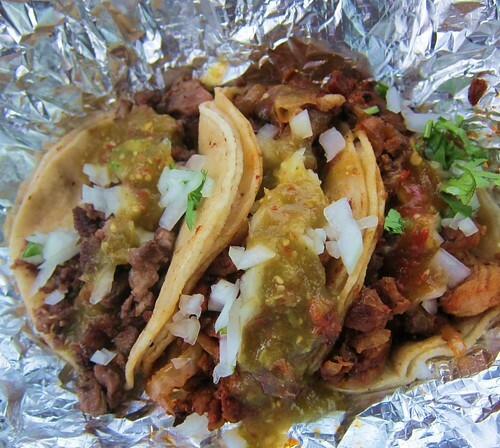 Tacos that are wrapped in foil and that go for a car ride will not taste the same as they would right out of the truck. Since I was just going to eat on the hood of my car it didn’t matter that much that my tacos were wrapped in foil. The tacos al pastor were cut from the spit then griddled with onions. Not my favorite method of al pastor but sometimes it works. This wasn’t working at all though. There were just too many onions and the pork was thick unseasoned cubes rather than a more shaved texture. 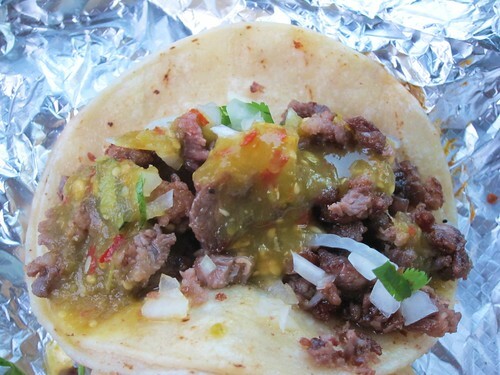 The carne asada was more palatable and went well with the very tasty and moderately spicy tomatillo and chile arbol salsa .The beef was hot , greasy, a little fatty but with a lot of flavor. The crowds kept coming though and it may say something about the great location. The wagon is right off the freeway and there really isn't another taco truck for a mile or two in each direction. 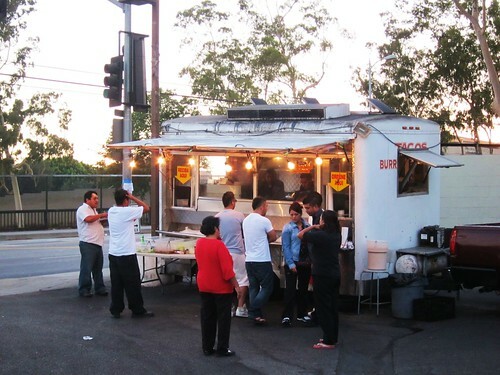 But I think the taco wagon with no name at E Cesar Chavez and 10 freeway should get a name(maybe they do and it's only known to locals). And maybe a menu painted on the front of the wagon. And less onions in the al pastor. But they should definitely keep the salsa verde.